To a blender, add the blackberries, coconut milk, sugar and vanilla extract. Pulse until smooth, about 1 minute. Give it a taste and adjust the salt according to your liking. 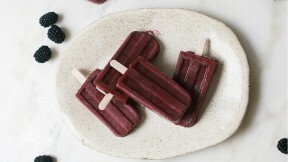 Divide the puree amongst the cavities in your popsicle mold. Transfer to the freezer for about 1 hour and then insert the popsicle sticks (if you add them early on, they might not stand-up straight). Freeze for an additional 4 to 5 hours, ideally overnight. To remove from the molds, run them under warm water until they release. Serve immediately.